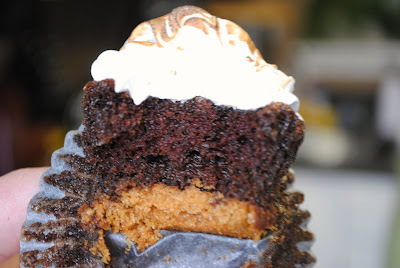 Graham cracker "crust", Hershey's chocolate, chocolate marshmallow cake, toasted marshmallow frosting... these cupcakes are the cake version of everyone's favorite campfire treat. They are fun to make and although it sounds like a lot of steps, each step is fairly simple. The "toasted" marshmallow can be achieved with a kitchen torch which is always fun to use and makes for an impressive presentation. They are gorgeous, makes me want one right now. Just stumbled upon your blog and love it! I've made these cupcakes before, they are ridiculously addicting! I've been brainstorming cupcakes like this for a while, but I'm glad to have found your recipe so that I won't need to experiment. They look wonderful! Glad you enjoyed them. They turned out beautifully! These cupcakes are beautiful! I would love to just have one nibble. Saw your pic on DessertStalking.com. These look amazing! I love the way the frosting turned out. They look totally delish! @52kitchenadventures - be careful on DessertStalking - that site will make you hungry! These look fabulous. I can't wait to try the recipe! I hope you don't mind me sharing your link with a few s'more lovers on my blog. Thanks for posting! @MeckMom - No problem - share away! Hope you enjoy them! I'm so excited about these! 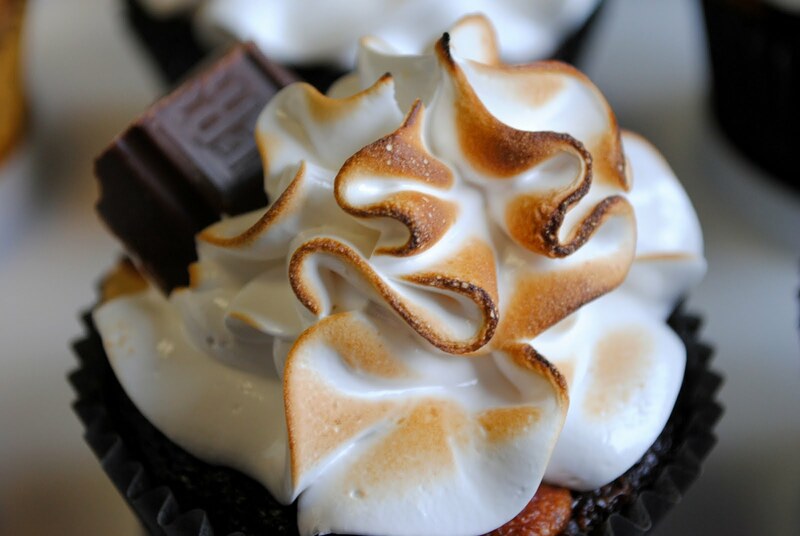 I have been looking for a good smores cupcake forever - there are so many out there that all seem the same (chocolate cupcake, marshmallow on top with a piece or drizzle of chocolate and graham cracker stuck in the top...boring!) I am making these tonight! So yummy! 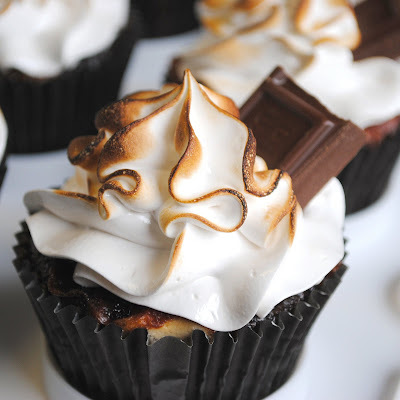 Today my son was begging for s'mores, so I said ok. Then he changed his mind and wanted s'mores cupcakes. I googled and found your recipe. We made them (he was a good helper with counting out the marshmallows and crushing the graham cracker crumbs) and are totally addicted now. Thanks so much for sharing! I just wish I knew how to decorate them as beautifully as you did (I'm not a baker by any means). Carrie - So glad you liked them! As for the decorating, a piping bag and star tip are all you need for the swirl but the kitchen torch definitely makes toasting the marshmallow frosting a whole lot easier. The taste is what counts though! 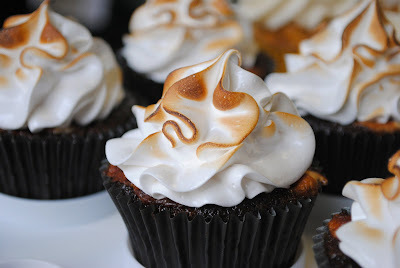 Hi there, just came to this post by way of your chocolate cupcakes with marshmellow frosting via Tastespotting. These look fantastic! I love the icing! How did you get it to pipe that way? @Ellaryn - Thank you! I used a Wilton 2D (closed star tip) to pipe the frosting on these and then use a kitchen torch to toast it. We are having a campout tonight and I didn't have chocolate bars or large marshmallows for s'mores. Found this recipe and went with it. Awesome!!! I was a little worried because the batter was very liquidy, but they turned out great. I put little marshmallows on top and broiled in the oven for a few minutes. Thanks for the fantastic recipe. You saved the campout!! These look awesome. My son wants to make them for his birthday party. Any chance skim milk could be substituted for the whole milk? @Holmes - You can use skim milk, the cake won't be quite as rich because of the lower fat content but it will work. If you have any half and half or heavy cream on hand, I've substituted 1 cup skim milk less 2 T and add in 2 T of cream or half and half. you can do a hell of a lot better than Hershey's chocolate, though. These look absolutely delicious! They are going to be added to my MUST COOK list! What great looking cupcakes! I'm doing some baking on Saturday for a party on Sunday. Does the marshmallow frosting hold up? Seems like it might be fairly perishable? Frosting them on Sunday would be best if you can swing it since the frosting is best eaten the day its made. It gets a bit of a crust as it sits but they are still good the next day too. They look yummy! How long can they sit out for? They are fine to sit out but the marshmallow frosting is better the fresher it is but they still taste good the next day or two too so don't worry too much if you have to do them in advance. Beautiful! Question: Are these regular size cupcake liners or mini? Yummy! I just made half a batch as a test run before my son's 1st birthday on the 15th. Everything was delicious! I need to get a better tip and a torch to really make the icing look its best. Thanks for the great recipe! @@mrs. E - glad you liked them - the torch really does make all the difference in the look! where do you find the kitchen torch at? Can this be used to make 8" cakes? Do you mean just the chocolate cake or do you want to put the graham cracker crust on the bottom of it too? You can definitely use the cake recipe, I've done that often. I'm not if the graham cracker crust would work though - it may burn due to the longer baking time required for a cake over cupcakes but I've never tried it. The frosting will be fine. this is SO good!! I'm made them for my brother's 18th birthday and they ROCKED!!!! Thanks for the recipe, I'll be looking forward to make it again. for some reason my mixture boiled over in the cupcake tins... not sure what i did. @Susan - I'm not sure about marshmallow cream - it might work but it might be difficult to get it to a consistency suitable for piping. If you try it, let me know how it works out. @Sabrina - I'm sorry, I'm not sure what happened, but my guess would be that you filled the tins too full. Another thing to check would be to see if your baking soda and powder are fresh, if the cupcakes didnt rise like they should then they could have gone over the edges but these don't rise all that much. Did you ever try to use chocolate cake mix and merigue powder in place of the egg whites? I haven't tried it but it may be possible. These look just amazing! While it's almost another year off, I think these are the perfect cupcakes for my twins' Firehouse 4th bday next year! Thanks! For the 1 and a half cups of graham crackers is it equivilant to 1 and a half cups of graham cracker crumbs? I was wondering if I could skip the step of crushing the graham crackers. Yes you can just use 1 1/2 cups of graham cracker crumbs. Hi Jen, I've never made the frosting with a torch. Since the egg whites are uncooked, I'm concerned, if you use a torch, it can't touch all the surfaces, as it will be burned by then? Will some of the frosting be uncooked then? @RA - you are "cooking" the egg whites by heating them over simmering water rather than the torch so you don't need to worry about only cooking part of the frosting. I MADE THESE A COUPLE OF WEEKS AGO FOR A DINNER PARTY. THEY WERE A HIT. GOING TO MAKE THEM AGAIN FOR MY NIECE'S BIRTHDAY PARTY. I CUT THE BOILING WATER BY A 1/2 CUP. THE BATTER WAS BEGINNING TO LOOK REALLY RUNNY AND THEY TURNED OUT FINE. THESE ARE THE MOST AMAZING CUPCAKES EVER!!! I RECENTLY LOST IT AND SPENT AN HOUR SEARCHING THE INTERNET FOR IT AGAIN. NOTHING COMPARES. AS FOR THE TORCH, I DON'T OWN ONE. INSTEAD, I BROIL THE CUPCAKES FOR JUST A COUPLE OF SECONDS AND IT WORKS JUST FINE!! If I don't have a thermometer, how can I guestimate the 160 degree mark for the frosting? It won't be really easy to tell, there isn't a trademark characteristic really. It will thicken and such but with raw egg whites, I would want to be careful and make sure I hit the 160 degrees just to ensure its safe. Is the egg white topping eggy? Because that is what I'm most afraid of...I hate the flavor of eggs in the desserts. So I have to come up with a item for my cooking class final, and it has to be made in 1hr 30min. and cost $4 or less, how long does this take to make on average? and can I cut the recipe in half to reduce costs? cant wait to try these! Well I can make these in less than an hour and half but you'll definitely want to practice or the steps will take you longer than that, you'll also need a refrigerator/freezer to cool the cupcakes faster or they will be too warm to ice. As for cost, is the $4 prorated based on the portion of ingredients you use or the total cost because there are a lot of components to this one so you would easily be over $4 if you had to buy the full quantity of everything. Cutting it any lower than 1/2 would be harder just because it's difficult to use 1/2 an egg but it can be done if you use careful measurements, as long as you reduce everything by the same fraction, the cake will turn out just fine. I love it. Thinking about making this for my youth group. :) Thanks. Thanks for sharing this! they look great and I have a bride who would like these for her wedding reception. How many cupcakes does each recipe make? 2 dozen? 4 dozen? Is the frosting a meringue? I don't really like meringue... But I do love marshmallows! I'm nervous to try it. I know you mentioned that its best day of, as it hardens a bit later; does that mean day of it will be soft like typical frosting? These do look amazing though! It's a soft marshmallow frosting, think more like marshmallow fluff rather than meringue. It gets a bit sticky and chewy the next day but its still good. Thanks! You were right, just like marshmallows. Definitely not meringue. :) However, I couldn't get it to thicken up at all. It tastes great, but its so runny. Any ideas what happened? I'd like to make these again, they're so delicious; but I'd like them to be more presentable! Made these and they are incredible! The cake batter was very runny and looked highly suspicious at first, but it turned out good. There was a lot of extra batter and frosting. Ultimately, the marshmallows and the crushed chocolate above the graham crakers could probably be omitted. 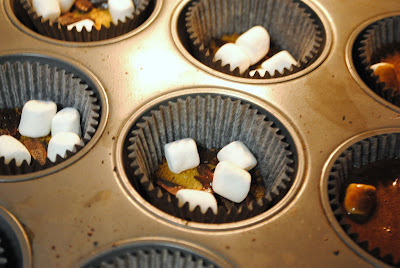 I couldn't taste them in the end and the marshmallows caused the tops of the cupcakes to appear volcanic and lumpy. For the graham craker crust, we ended up using one and a half packages to get the required amount of crushed graham crakers, and we used a blender because we didin't have a food procesor. It worked wonderfully! We will definately be making these again. Thank you for this cozy cupcake recipe. I'm always baking and a friend has ask me to make campfire cupcakes for her son's 13th b-day party which is this Saturday. After googling for the perfect recipe, I've found your's to be the most creative and after reading your reviews, I just know they will be delicious. They look so good, I have to try this recipe! But I have one question; I'm from Norway and we use other measurements than in the US, so can you please tell me what the "T" stands for? In 2 cups plus 2 T sugar. Wow, what a mess to eat. But SOOOOOOO worth it! De-lish! And I just did the high broil in the oven for 30 sec, which worked great. Beth, I think the frosting is perfectly safe however, if you don't feel comfortable, you can also use a pasteurized egg white product or meringue powder in place of the egg whites. I'm not sure of the conversion but that would be an option. Your shower sounds cute! Best of luck! I made these today for my friend's "camping" themed baby shower. They were a huge hit, everyone loved them. I torched mini marshmallows on top of chocolate frosting in place of the meringue frosting. I followed your directions for one T Graham crust, but it was not nearly the same look as your picture shows. Next time I will use two or three T. Thanks for a successful recipe! !